If you have a defined goal for your product, talk through everything that feels undefined that needs to happen in order for your product to be successful. As you’re grappling with things that could go wrong, have someone on hand to translate fears into questions that can be answered objectively. “What if no one uses it?” becomes “What will make this compelling to the users we’re trying to target?” This will help your team understand the range of problems you’re trying to solve. If your product is still fuzzy, try writing up a Lean Canvas or similar plan designed to get specific about your business plan. The goal of building proto personas is to take an educated guess about who your end users are, what they’ll need, and how you’ll might reach them. If you don’t have a clear picture of who you’re going after, that’s okay. In fact, not thinking in strict demographics will help you recruit a wider range of potential users, which will help you identify audiences that are likely to be excited about your product and likely to help it grow. Brainstorm activities your product supports and problems your product might be able to solve then brainstorm people who might enjoy those activities or share those problems. What are the key aspects of this user’s life situation that are relevant to our design inquiry? What is his/her technical ability, familiarity with technology and frequency of use? What does this user want to achieve using your product? Why is achieving these goals difficult today? How do they accomplish them anyway? As you think through proto personas, capture them on a whiteboard. Once you’ve got a list of potential users down, discuss which of these audiences seem easiest to recruit, which constitute a large target audience, and finally, which are most likely to pay for and use your service. Overlap between those sets is a great place to focus your research. Have the team dot vote personas which seem promising. For this product, we’re going to focus on people who are active at the gym: they’re a large target market, easy to recruit, and have already invested a lot in their health. Now that you know what questions you’d like to ask and who you’d like to ask them to, it’s time to gather up those threads into a statement that defines the scope of your inquiry. A good research statement defines a strict scope of work. It should be the big question that answers the smaller questions you’ve generated. 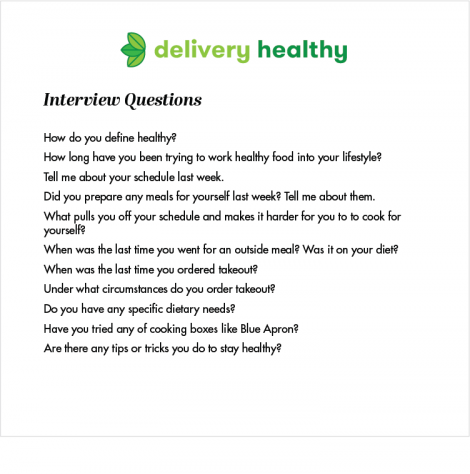 We will interview millenials to determine whether or not they would use a delivery service offering them healthy food. What’s wrong with this statement? 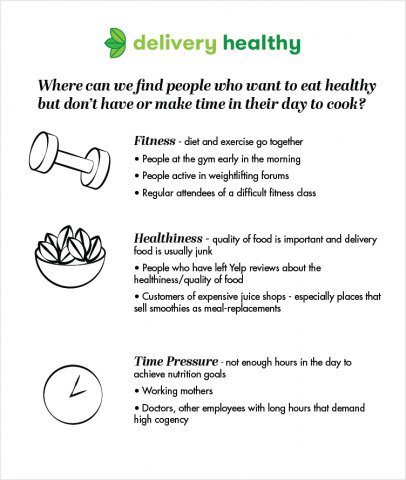 The respondents (“millenials”) are defined by demographic, not specific attributes, and the inquiry (“whether or not they would use a delivery service offering them healthy food”) can be answered with a simple yes or no, rather than illuminating the life circumstances that would make the service compelling. 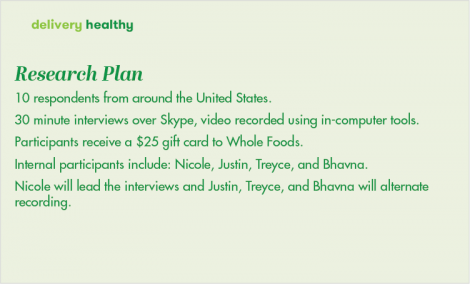 We will interview young professionals with 50+ hour work weeks to determine how they define and meet nutritional goals. Here, the respondents (“young professionals with 50+ hour work weeks”) share a need: to incorporate eating into an already full schedule with little time for food prep, and the inquiry (“determine how they feed themselves on tight schedules”) opens the door for more questions about their lifestyle. Between 5 and 10 is a good number to target. If you’ve identified multiple personas you want to learn more about, set a goal of recruiting 5-7 of each. Interviews usually run between 15-45 minutes. The time you allocate depends on the length of your script. Give yourself a little more time than you think you’ll need in case other questions come up. You can always change it later! What incentives will you provide? A good rule of thumb is to pay roughly the hourly wage of your respondents—a doctor and a teenager with a summer job will need different amounts for an interview to be worth their time. We generally give out gift cards or cash, depending on the length of the interview and the interests of the respondent. We make sure to have them on hand and ready to give out, even (especially) if the interview goes poorly and we want to end early. What kind of recording equipment will you use? Recording interviews (in addition to written notes from participants) is important in later steps of the process and useful if you need to convince stakeholders that yes, your users really did say that. A recording can be as simple as an audio file from your phone or can include video of the participant and screen recording. Talk to your team about how much data you need to capture. Who from your team will participate? Identify who on your team will lead the interviews (it’s best to have one person lead all the interviews so they stay consistent) and who will participate. Ideally, your entire team will show up to take notes for one or more interview—it’s a great way of getting the developers who have to build the product to better understand the audience they’re building for. We try and rotate a new team member into each interview session until the whole team has seen at least one. We find that once someone participates in one session, they are more likely to trust the insights from the others that they don’t necessarily attend in person. These questions will give us a sense of what our user is trying to achieve, what obstacles they face, and what they think of existing competitors. They also should flow together so the interview feels like a conversation, but you’ll hear about that more later. Coming up next – Recruiting and Scheduling. If this all feels a little overwhelming, don’t despair! It gets easier with practice. But if you’re looking for a little more practice while you learn, Carbon Five offers a User Research Sprint that will teach you these skills hands-on and help you apply them to your product.